To order a printed copy of the Pia Jewellery catalogue, simply click the Request button below. The Pia collection celebrates their passion for truly creative styling and craftsmanship from all over the world. Their designs are timeless classics, often inspired by nature or reflecting a cool modernity. Pia Jewellery is lovingly crafted to the highest standards and yet surprisingly affordable. All safely delivered to your home in beautifully presented boxes. Their sumptuous bags and luxurious accessories complement their jewellery perfectly. They have great gifts for everything you want to celebrate – an enduring friendship, a family anniversary or just a treat for yourself. All of their jewellery is hypoallergenic and conforms to European safety standards, including the control of nickel. 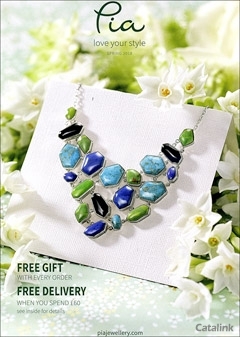 Pia Jewellery Catalogue Annette W. said: Received Qucikly - like the catalogue. Incentivised me to look online too! Pia Jewellery Catalogue Eileen P. said: Lovely jewellery,different and reasonably priced. Pia Jewellery Catalogue Angels M. said: Lovely jewellery would make lovely gifts to give people or something nice for yourself. Pia Jewellery Catalogue Cheryl B. said: Lovely jewellery but a little pricey for me at the moment. Pia Jewellery Catalogue Agnes F. said: I love the brochure, it is so amazing and lovely. <i>LOCCITANE</I> offer high-quality beauty products and fragrances that give you lasting moments of well-being and sensory delight ... Sign up for savings and beauty tips from the experts - sign up to the <i>LOCCITANE</i> newsletter today. Culture Vultures mission is to celebrate the diversity of cultures with distinctive, unusual and inspiring products. They celebrate the traditional crafts, food, arts and quintessential style of countries from Russia to South America, Italy to New England. With five Generations of jewellers at the helm, the family heritage of Shipton &amp; Co., is clear to see in their range of products. As youd expect from family run business steeped in the creation and manufacture of fine jewellery, they have a huge and unique range, over 26,000 items in fact. By pressing the Request Printed Catalogue button you give consent to Pia Jewellery (and their Data Processors for the specific purpose of delivering your literature) to send you their Catalogue.